The eighth anniversary of the bankruptcy of the Lehman Brothers investment bank is coming up later this month. It marked a point where the financial crisis, which had been simmering since summer 2007, seemed to go from bad to catastrophic. 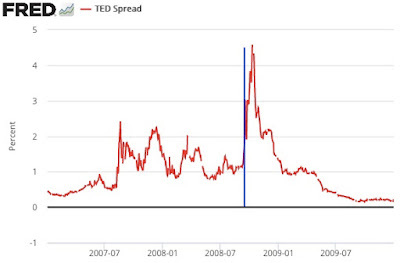 One indicator of financial stress that we were all watching closely at the time was the "TED Spread" - the difference between the 3-month LIBOR (a rate on interbank loans) and the yield on 3-month US Treasuries - essentially a measure of the risk premium paid by financial institutions, which is normally quite low. 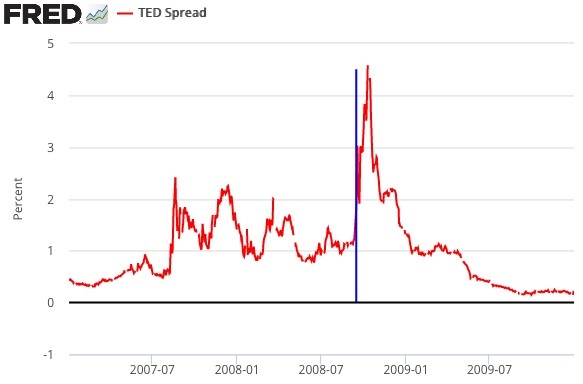 The blue line is drawn at Sept.15, 2008, the date of the Lehman Bankruptcy. The Fed creatively expanded its "Lender of Last Resort" toolkit during the crisis, creating a number of new lending programs. In March, it helped arrange the takeover of Bear Stearns by JP Morgan Chase. Monday-morning quarterbacking of the government's actions (both the Fed's the Treasury's) began immediately and has never really stopped (academic macroeconomists consider it part of our jobs, after all). One of the biggest questions has been why didn't Lehman Brothers get the same treatment as Bear Stearns? The Fed did try to arrange a takeover by a healthier firm - a potential deal with Barclays was reportedly scuppered by British regulators - but no deal was finalized in time. At the time, "moral hazard" concerns were prominent, and people felt the US government wanted to show that it was willing to let a financial institution fail. Lehman's troubles were well-known, so it was hoped that the financial disruption would be modest since everyone had time to prepare for its demise. More recently, officials have claimed that the Fed lacked the legal authority to rescue Lehman because it was truly insolvent - the intention of lender of last resort is to lend to illiquid banks, not insolvent ones (the Fed's loans are supposed to be backed by good collateral). Ball's argument was also discussed in a column by James Stewart in the New York Times. As subsequent events have shown, most especially with the Fed-led bailout of insurance giant American International Group, if there was a will, there most certainly was a way. Given all of the various bailouts of dubious legality, the Fed, Treasury and Congress most certainly could have devised a rescue plan for the 158-year old bank. Being an academic economist can be humbling - while it involves learning lots of esoteric stuff, it also makes one much more aware of how much one doesn't know. But I know this much is true: the total amount of goods and services produced in Ireland did not increase by 26.3% in 2015. But that's what Ireland's Central Statistics Office has reported. It's not entirely clear how they came to such a (literally) incredible figure for real GDP growth. The expenditure approach to calculating GDP adds up purchases of new final goods and services in four categories - consumption (C), investment (I), government purchases (G) and net exports (NX). I took the data from table 6 of their release and normalized each component to 100 in 2010 to illustrate how the change is driven by large jumps in I and NX. News reports have focused on activities of multinational corporations, particularly on "inversions" which involve transferring their legal headquarters to Ireland in order to take advantage of its low corporate tax rates. That may be correct, but its not an entirely satisfying explanation. GDP is supposed to measure the value of goods and services produced in a country. The legal domicile of the corporations producing it is irrelevant. Ownership of capital - both physical machinery, equipment and structures and also intangible forms (intellectual property, etc.) - also is irrelevant, so the fact that multinational corporations like to hold IP in Ireland for tax reasons shouldn't matter in principle. Gross National Product (GNP) adds up the total value of goods and services produced with resources owned by a country's citizens. Since many multinational corporations operate in Ireland, it has higher GDP than GNP because some of its GDP is produced using foreign-owned capital - the same data release showed a shocking increase of 18.7% in Ireland's GNP last year. The information released by the CSO is not very detailed. 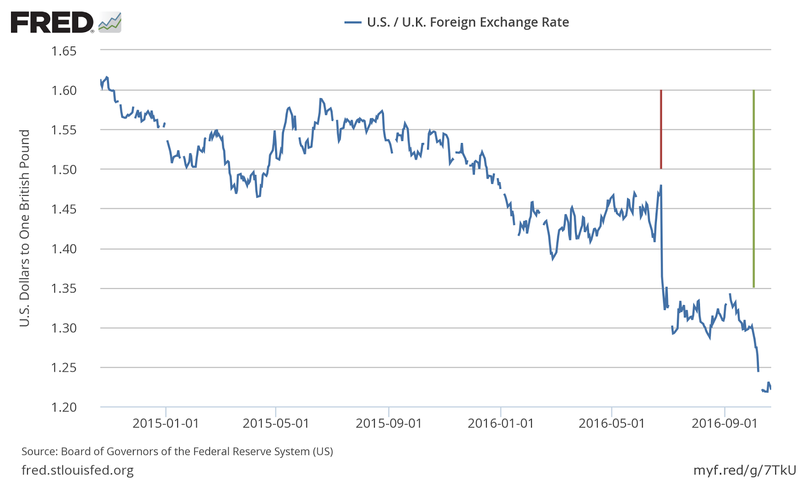 The FT Alphaville's Matthew Klein, Bloomberg Columnist Leonid Bershidsky, and Seamus Coffey at the Irish Economy blog have made useful attempts at sorting things out. 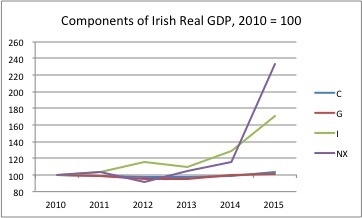 Clearly, the way the CSO is calculating GDP is failing to correspond to the concept. Statistical agencies need to provide estimates calculated in a consistent fashion, so it wouldn't have been appropriate for them to suddenly decide to calculate it differently because they got a strange number. But the methods for estimating GDP are not etched in stone. If legal and accounting maneuvers of multinationals are distorting some of their source data, they need to find a way of correcting for it. Standards for national accounts are coordinated internationally and it is not clear whether the problems in this report are due to something the CSO is doing or a more general methodological issue which happens to be most apparent because of Ireland's unique circumstances. Statistical agencies update their methods and revise their estimates regularly - e.g., in 2013, the US BEA did a "comprehensive revision" that began the treatment of development of intellectual property as a component of investment (see this earlier blog post). I hope the CSO will release more information to help everyone better understand what's gone wrong with their figures. That will be a first step towards correcting the method used to estimate GDP and producing a revised set of figures - one which will not show a 26% increase in real GDP in 2015. Update: Procedures mandated by Eurostat are mostly to blame, writes Colm McCarthy. I've posted a draft of my research paper, "Hysteresis in a New Keynesian Model" on my website. 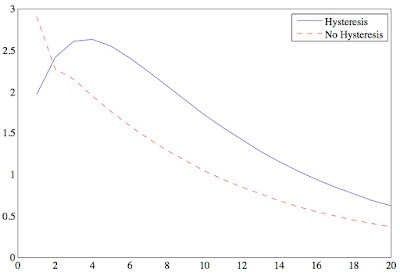 The paper proposes a way of modelling hysteresis and integrates it into a New Keynesian macro model. I cite empirical evidence for (2) and (3) in the paper. 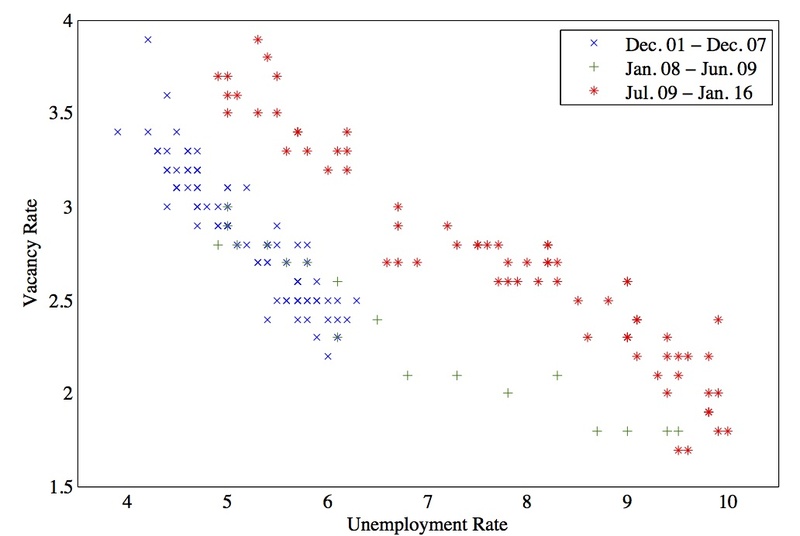 The paper does not take a stand on the mechanism causing the relationship between matching efficiency and duration of unemployment. 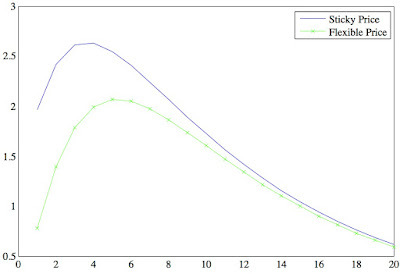 Hysteresis is modeled with the assumption that matching efficiency (A) is a decreasing function of the average duration of unemployment spells. 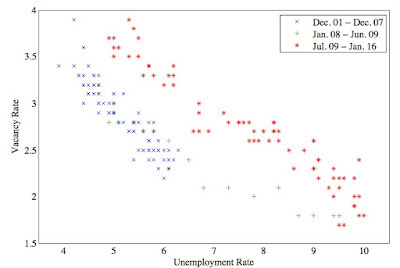 The reason for this is that, in the absence of hysteresis, firms can adjust their labor by sharply decreasing their vacancy posting. 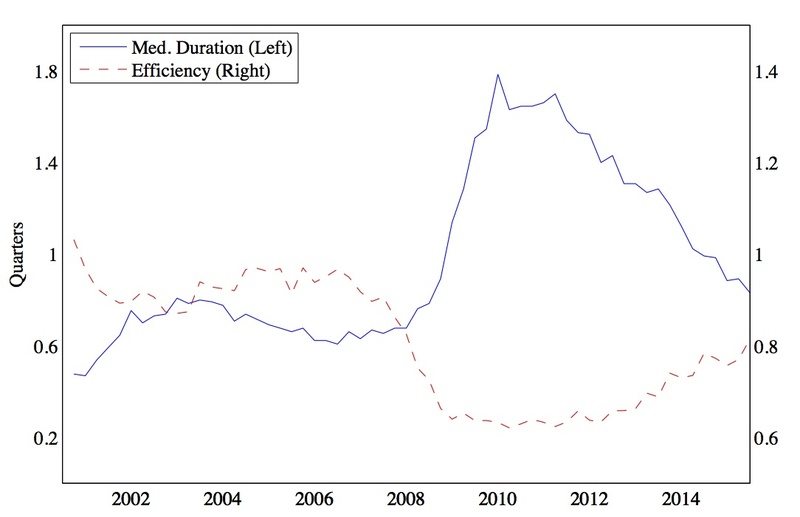 With hysteresis, the response of vacancies is less dramatic because firms take into account the fact that hiring will be more difficult in the future due to the decline in matching efficiency. 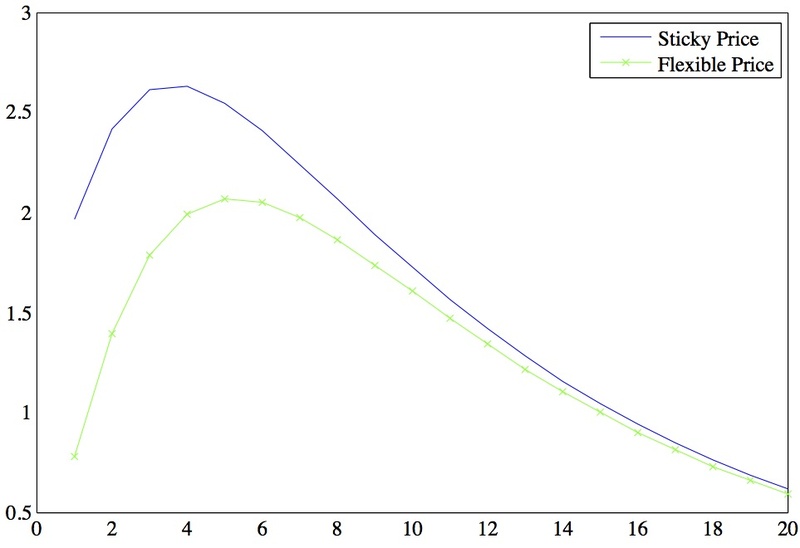 The model also considers demand shocks, which take the form of shocks to the discount factor, and monetary shocks (deviations from the Taylor rule), with similar results. 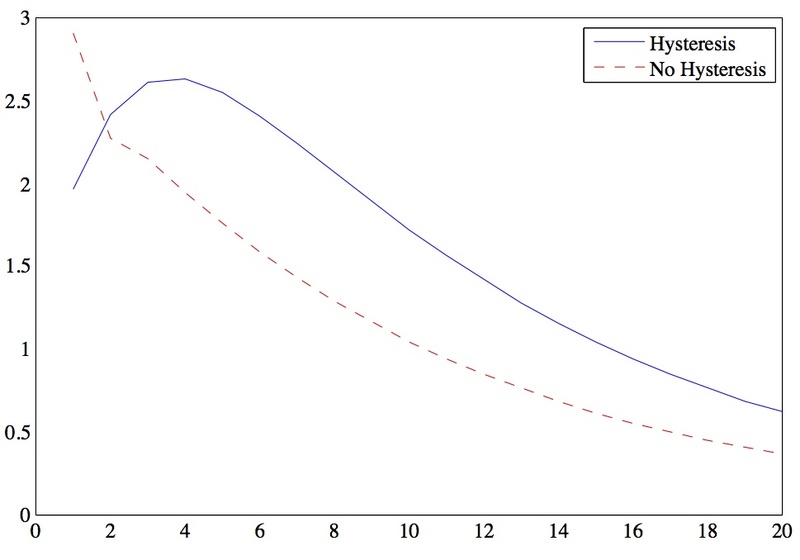 Overall, hysteresis acts as a mechanism that increases the persistence of the response of macroeconomic variables to shocks. Since macro models struggle to generate endogenous persistence, this may be one of the main selling points of the paper. Note: this is a revised version of the draft circulated last fall as my "job market paper". The 1920-70 expansion grew out of the second industrial revolution, when fossil fuels, the internal-combustion engine, advanced metals and factory automation came together to produce electric lighting, indoor plumbing, home appliances, motor vehicles, air travel, air conditioning, television and much longer life expectancy. Although revolutionary, the Internet's effects were limited when compared with the second industrial revolution, which changed everything. The former had little effect on purchases of food, clothing, cars, furniture, fuel and appliances. A pedicure is a pedicure whether the customer is reading a magazine or surfing the web on a smartphone. Computers aren't everywhere: We don’t eat, wear or drive them to work. We don't let them cut our hair. We live in dwellings that have appliances much like those of the 1950s and we drive in motor vehicles that perform the same functions as in the 1950s, albeit with more convenience and safety. Our main measure of technological progress is total factor productivity (tfp) growth, which is sometimes called the "Solow residual" because it is calculated as a leftover, by subtracting from output growth the portions that can be explained by changes in capital and labor. That is, it is the growth that would occur even if there was no change in the factors of production. 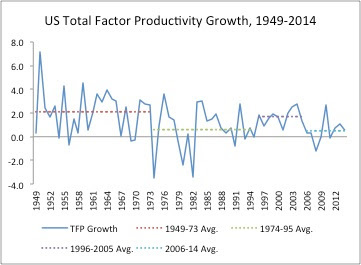 Turning points in tfp growth can be hard to identify because the data are somewhat volatile from year-to-year and have a cyclical component. 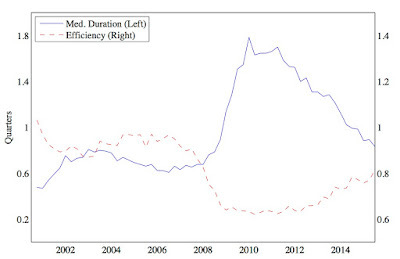 With hindsight, economists identified a productivity slowdown around 1973 and a resurgence - with information technology playing a leading role - in the mid-1990s. However, tfp growth has generally been weak since 2005, raising the question of whether the IT-led productivity boom is over. This San Francisco Fed Letter from last year discusses some of the reasons for the productivity slowdown. Gordon's book was the subject of an Eduardo Porter column and a Paul Krugman review. Update (2/25): In an interview with Ezra Klein, Bill Gates argues against Gordon's view.